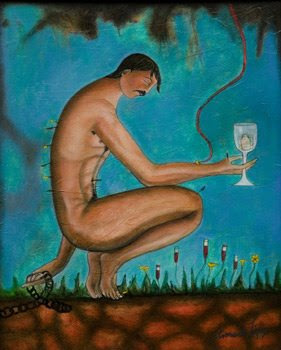 The agony of AIDS and its treatment is expressed in “El Martir” (The Martyr) by Armando Lopez. It is posted here today for World AIDS Day. Lopez reinterprets St. Sebastian as an AIDS patient suffering under harrowing modern health-care procedures. Both patients and their caregivers can relate to the contemporary medical martyrdom in the poignant painting. Lopez, a New Mexico folk artist, painted it as a tribute to all those who died from AIDS in the early years of experimentation by the medical profession. St. Sebastian, a third-century Christian saint, is traditionally presented as a near-naked martyr shot with arrows. Lopez’s martyr is punctured not by arrows, but by the many needles used for medical treatment. He’s stuck like a pincushion with acupuncture needles and hypodermic syringes. He receives fluids from an intravenous drip while holding a glass with the drug cocktail for treating AIDS. IV bags and syringes sprout from the earth around him, along with a few brave flowers. The martyr’s warm flesh tones contrast with the deeply saturated aquamarine background. Lopez’ startling imagery reminds me of the stylized forms of Modigliani and the magical symbolism of Marc Chagall. I have been haunted by “El Martir” since I first saw it in person last year at the National Festival of Progressive Spiritual Art in Taos, NM. I lost many friends to AIDS while ministering in San Francisco’s Castro district in the late 1980s, when the AIDS death toll was at its height in America. There were no effective treatments then, although there were ineffective ones with horrible side effects. I post “El Martir” in honor of my friends who died of AIDS, and of all who have been affected by HIV/AIDS. Lopez is a Tarascan native born in the small village of Santa Maria in the southwest Mexican state of Michoacan. He uses both native Tarascan and Catholic imagery in his paintings and mixed media work. He works with lush, glowing colors and fanciful imagery based on his own visions. Lopez has been featured in exhibitions across the Americas, including the Contemporary Hispanic Market in Santa Fe, NM, and the prestigious juried Festival of the Arts in Coconut Grove, FL. “El Martir” is an oil on canvas measuring 20 by 16 inches.